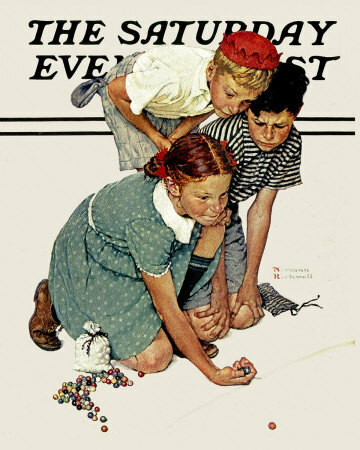 Marble Champion, a Norman Rockwell painting, appeared on the cover of The Saturday Evening Post published September 2, 1939. This is another favorite of Rockwell collectors, a classic enduring image of the world Rockwell painted. An alternate title for this painting is Actress Putting On Make Up. This painting was Rockwell's 189th overall out of 322 total paintings that were published on the cover of the Saturday Evening Post. Rockwell's career with the Post spanned 47 years, from his first cover illustration, Boy With Baby Carriage in 1916 to his last, Portrait of John F. Kennedy, in 1963. This was also the sixth cover for The Post in 1939. In 1939, there were eight Norman Rockwell Saturday Evening Post covers published. The original oil on canvas painting, 28 x 22 inches or 71 x 55 cm, is part of the collection of film maker George Lucas and was on display at the Smithsonian's Museum of American Art in 2010. One study for the painting, 13.75 x 11.75 inches or 34.9 x 29.8 cm, brought $114,000 at auction at Sotheby's in New York City on November 29, 2006.
on page 142 of Norman Rockwell, A Definitive Catalogue by Laurie Norton Moffatt. In this painting, Norman Rockwell shows us how some skill can be used to advantage. The young schoolboy on the right has just been schooled. The young lady teaching this lesson is about to win all the marbles. She is shooting for the last marble. From the looks of it, she doesn't miss. The boy's matble bag, the black and white striped one that matches his shirt, is lying flat and empty on the ground. The girl's marble bag, the white one, is as full as she can get it and still be able to tie it securely shut. There are still over half a bag's worth of marbles lying on the ground in her pile. I tried to count the extra marbles, but stopped when I reached sixty. The boy with the red hat is intently watching this match. His marble bag is langing limp out of his back pocket. Apparently he was her previous victim. Is he now an admirer of her marble skills or is he trying to pick up some hints on how to shoot? The expressions on the children's faces tell the whole story. Marble Champion was only one of 322 Norman Rockwell Saturday Evening Post covers; Here is the list of Norman Rockwell Saturday Evening Post cover illustrations. Poor boys! School has just started and they are already out of marbles. Several contrasts are at work here. Winning vs losing. Red hair vs brunette. Female vs male. It is also interesting to see the period children's clothing. Do You Have A Great Story, Opinion Or Contribution About Marbles Champion?